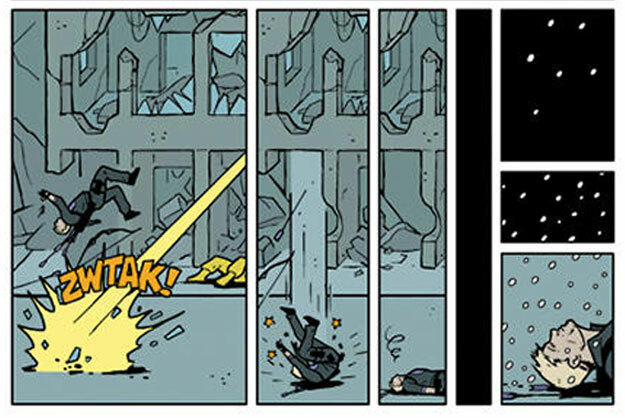 Fraction's new Hawkeye series nearly hit's it's target Dead on! Me with Marvel's Ultimate Hipster and current writer of Hawkeye: Matt Fraction at Hero-Con 2011 in Charlotte NC! 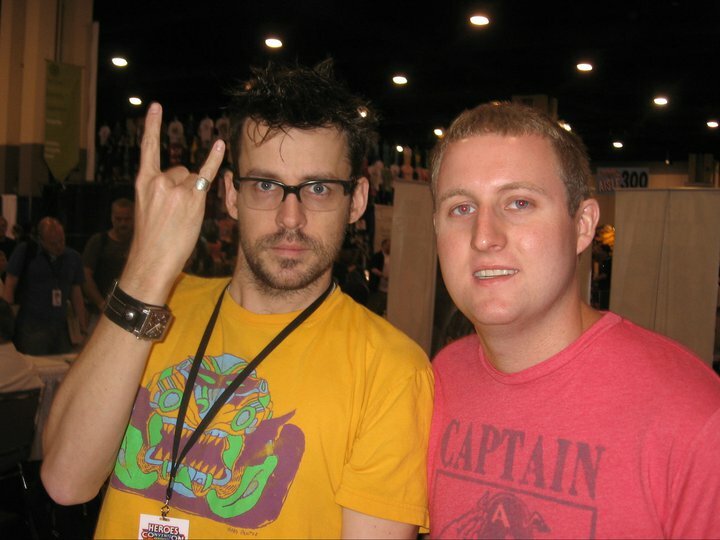 I have always been a Hawkeye guy, and that's coming from someone who is also a big fan of Green Arrow. Hawkeye always had that military bad-assery vibe, that sets him apart from other bow wielding heroes. I have also always been a Matt Fraction guy as well, thoroughly enjoying the hipster's redefining run on Iron Man with Salvador Laroca, so this new Hawkeye series set up pretty well for me from the get go. Interestingly enough this new series, which started out with a #1 pre-dating the Marvel Now publishing initiative, fused together with that initiative very well after it's launch. 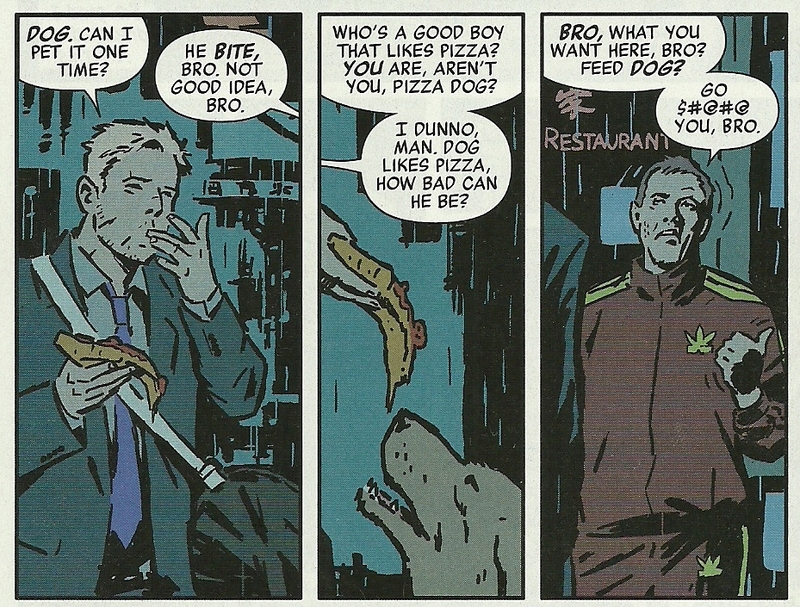 Hawkeye just want's to chill with his dog, even if he has to go through the Russian Mob to do it! Fraction does a great job of humanizing not only Clint Barton's character, but also the life he lives when he isn't working as an Avenger. When Hawkeye isn't on official SHIELD business he apparently likes to spend his time enjoying an ice cold beer at roof tops cookouts or just chilling with his newly acquired dog. While the first 3 issues or so of this trade have some very tight stand alone stories, they work together in setting up their primary objective of establishing Clint Barton as your everyday bro at heart! 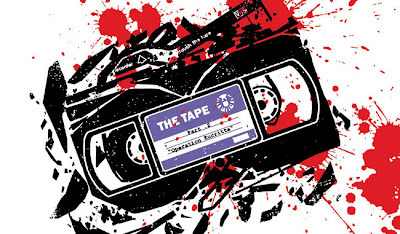 The 2 part arc "The Tape" was probably the best Hawkeye story in years! The series really hits it's stride during a two part arc entitled: 'The Tape'. 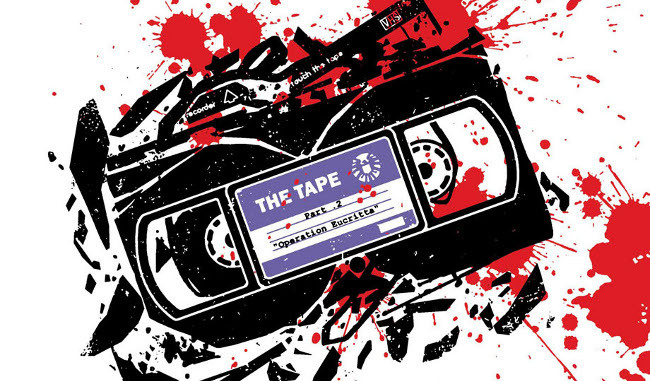 The Tape refers to evidence that Clint Barton assassinated a world terrorist leader at the direction of SHIELD. The story follows Clint Barton's mission to acquire the tape at a auction in Madripoor, an auction that is attended by some of the most elite scum of the Marvel universe such as Wilson Fisk (a.k.a. King Pin) and Madam Masque. While this is the most traditional "comic book" story told within this trade (and probably the most interesting for that matter), Fraction still manages to keep the focus on Clint's character rather than getting caught up in the action movie type narrative going on around him. This is done in the form of further developing Clint's friendship with Kate Bishop, who served as Hawkeye while Clint was Ronin back in Brian Michael Bendis's run on New Avengers. The friendship/partnership between Clint and Kate is a major plot point in the overall book but truly is elevated to the next level during 'The Tape'. 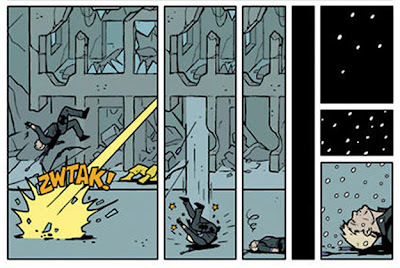 David Aja's action scenes were a little too minimalist for my taste! 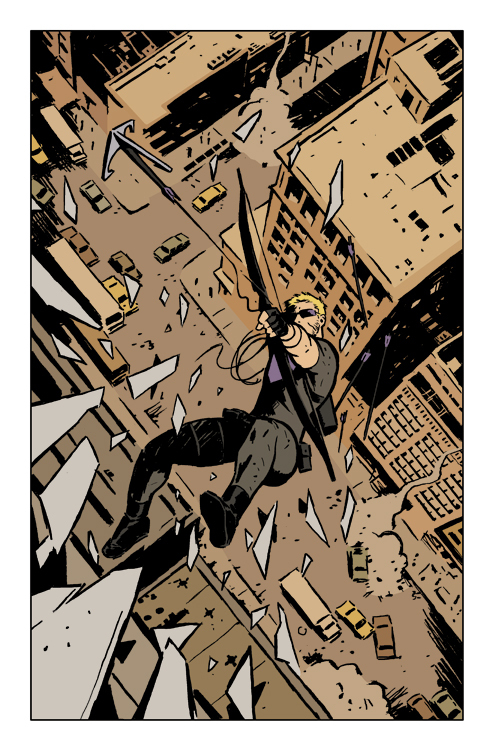 The art of this book is really what separates it from other titles at Marvel right now as both David Aja and Javier Pulido bring a minimalist approach to Hawkeye, sometimes for the better and sometimes for the worse. 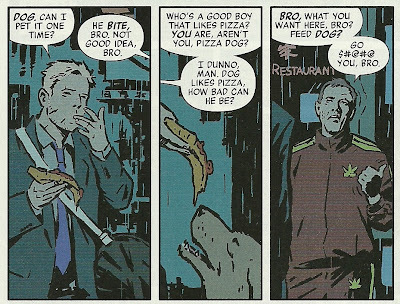 It is obvious that Marvel chose Aja and Pulido for this very minimalist approach which fits the tone of this book very well; minimalist art really matches up with Fraction's goal to make Clint Barton appear as an everyday man when he isn't wielding the bow and it works incredibly well in scenes like the rooftop cookouts Clint likes to frequent. However, I feel like heavy action scenes are negatively affected by minimalist art, particularly with Aja's work. Pulido's work on the tape was probably the best art work of the book because it allowed the book to keep it's feel, while at the same time adding some much needed detail to action scenes. 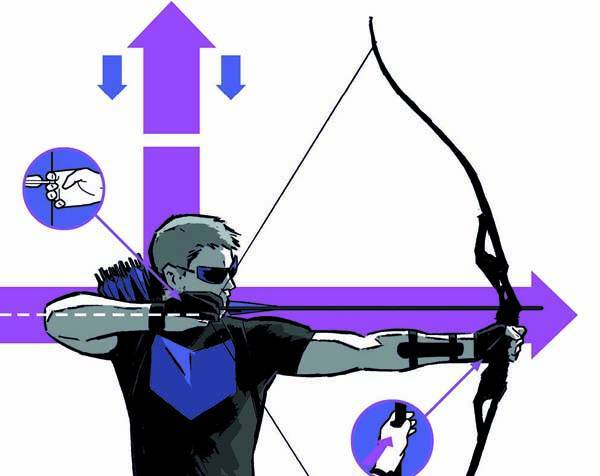 Overall Matt Fraction's new Hawkeye series accomplishes what it set out to do, which is to give Clint Barton's character some much needed depth that we haven't seen in a while. Fraction is able to get you to care about Clint Barton personally, which makes his time as Hawkeye much more meaningful. While the evolution of the Hawkeye character is successfully accomplished in this book, an extreme minimalist approach and Fraction's tendency to rely too heavily on Tarantino like reverse story telling ad nauseam over the course of the first 3 issues keep this trade from reaching EPIC status. Bradley, I've been reading this series from Issue #1, and am currently completely up to date on it. I would tend to overall agree with your interpretation of its art and story. The storyline does make you very much care about Clint Barton, the person. But there are times the minimalist approach makes it a bit...odd. I would like to see just a TAD bit more art to the book, as I appreciate the art as much, if not more, than the story at times in most books I read.  There have been a few recurring characters that make for an interesting side-story/main-story mix, which is proven to be apparently culminating in the next issue or two before a new arc may start involving a major Marvel villain if there is any foreshadowing being done.